There are plenty of examples of people doubting (, , , , ) or denying (, , ) the existence of atoms. Is there any compelling evidence for the existence of atoms? Has anyone ever actually seen one? Are there any pictures of atoms? I am skeptical that atoms are anything more than a useful mathematical model. Atoms are too small to see with microscopes that rely on light (also due to problems such as the Abbe diffraction limit). Essentially, with a conventional microscope you cannot distinguish points that are too close. Even the recently introduced superresolution microscopes, which can surpass this limit, are still not able to image single atoms (they can, however distinguish single molecules, with a distance of <20nm). This is mostly due to the fact that these microscopes rely on light, which has a wavelength that is too long to "catch atoms" (pardon the non-scientific wording of this sentence). However, several other techniques exist that allow us to "see" atoms. I would like to stress that the very nature of atoms prevents us to actually have a photo of them like we take a photo of a macroscopic object. High resolution electron microscopy (HRTEM), which uses the phase-shift of a wave of electrons thrown at the sample. Another technique is X-ray crystallography. I am not going to explain the mathematics and physics beyond it, as they are quite complex but essentially you take a crystal of the molecule you like, shine an X-ray beam on it and look at how the X-rays are scattered by the atoms in the crystal. The diffraction pattern does not per se show the single atoms, but mathematical analysis of the diffraction spots allows for reconstruction of an electron density map and subsequently of the structure of the molecule. 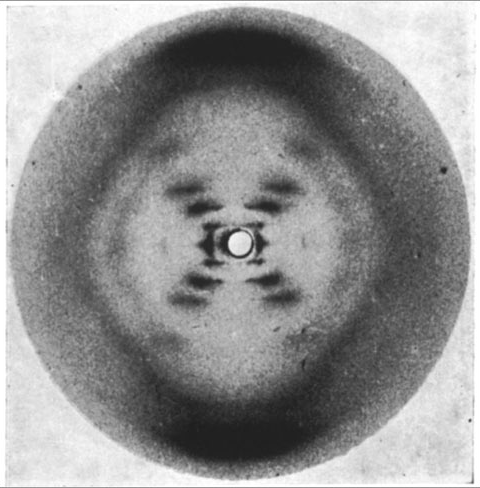 Probably one of the most famous X-ray diffraction patterns is Photo 51 made by Rosalind Franklin of DNA, which was then used by the Nobel prize winners James D. Watson and Francis Crick. See also some published papers at this regard. Finally another technique is the Atomic force microscope. The principle is to have a very small cantilever that can pass over the sample and gets pushed up and down due to interaction with the electron fields of atoms. 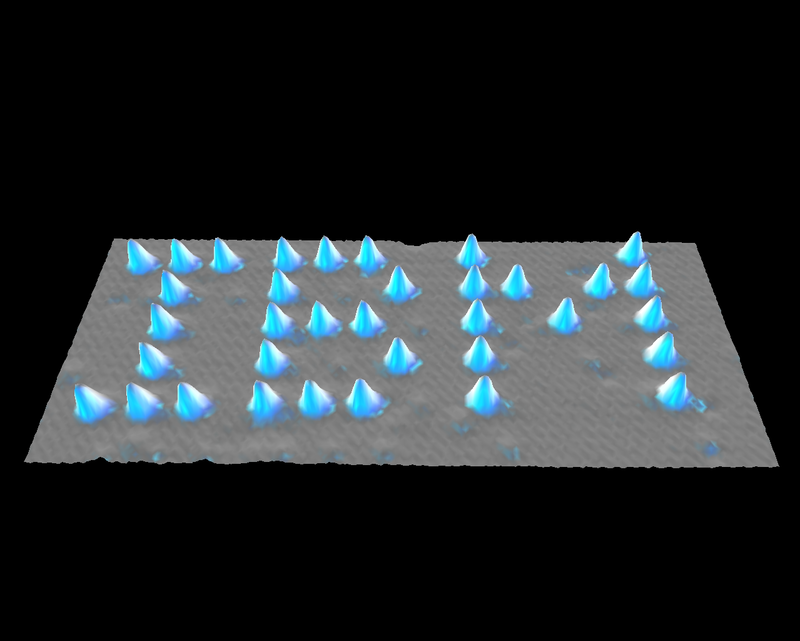 An enhanced version of AFM was developed in 2009, which allows to see atoms and bonds in a molecule. Pentacene molecule. Top: ball and stick model, middle: classical SFM, bottom: enhanced SFM. Scale bar 5 angstrom. 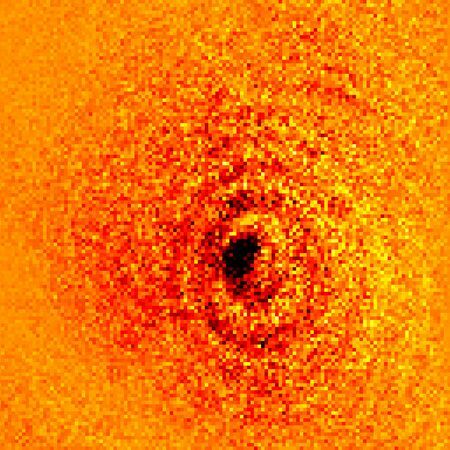 Update: Scientests have now taken a photograph of a single ytterbium atom, showing the shadow created by a laser hitting it. No discussion of atoms would be complete without mentioning Brownian motion. Brownian motion is the strange, seemingly random movement of small particles (like dust) when suspended in a fluid. This phenomenon went unexplained for almost 80 years, until Einstein published a paper in 1905 (the same year he published his paper on the special theory of relativity) showing that, if we assume atoms exist and that Brownian motion is due to atoms bombarding the particle, the movement will behave in a very particular way. He even gave equations for estimating the size of the atoms! At first the paper was ignored, as it didn't agree with the observed particle movement; however, it turns out earlier experiments were flawed, and through a series of very careful experiments in 1908-09, Jean Perrin verified that the particles did indeed move in exactly the way Einstein predicted. For this work, Jean Perrin won the Nobel Prize. This is usually considered the turning point of atomic theory - before this work, the scientific world was divided about the existence of atoms, but after this their existence became very hard to deny. I also had the doubt a few years back - are they real-real or just abstractions? - until the following, interesting and very convincing peer-reviewed literature on the topic came out! D.M. Eigler, E.K. Schweizer. 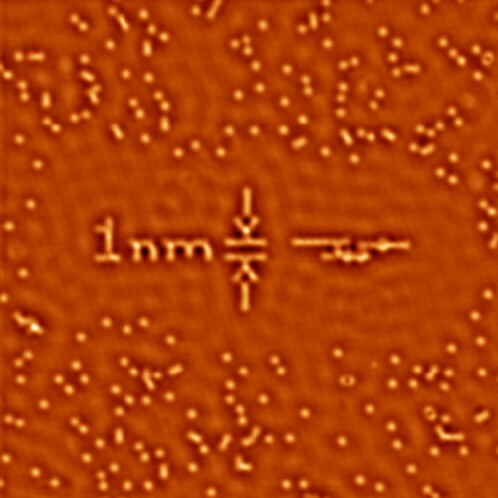 Positioning single atoms with a scanning tunneling microscope. Nature 344, 524-526 (1990). 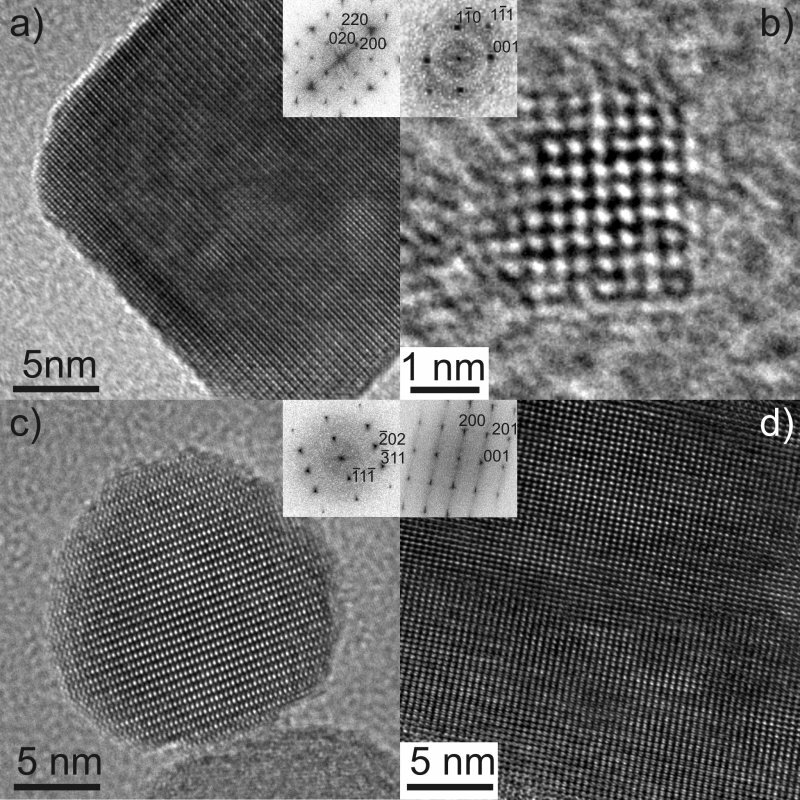 Here we report the use of the STM at low temperatures (4 K) to position individual xenon atoms on a single-crystal nickel surface with atomic precision. This capacity has allowed us to fabricate rudimentary structures of our own design, atom by atom. The processes we describe are in principle applicable to molecules also. In view of the device-like characteristics reported for single atoms on surfaces, the possibilities for perhaps the ultimate in device miniaturization are evident. The following image is given. Yes, it's a digital image because that's how scanning-tunnelling microscopes work. All the data represented is real (just like a digital picture). 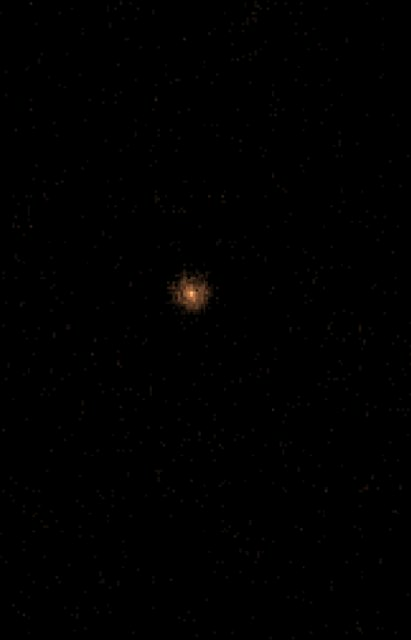 Furthermore, a single strontium atom has been photographed using an ordinary camera by a group at Oxford university, here's the picture -- click to zoom. 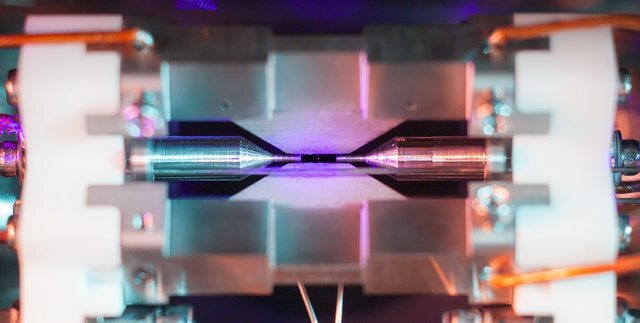 Would an actual picture of a single captured atom convince you? IBM had a great project that provided pictures and even a video of atoms. The video is called "A Boy and His Atom." It holds the Guinness World Records record for the World's Smallest Stop-Motion Film, which isn't the most prestigious and convincing award, but it's something. You can see how it is made in the video, "Moving Atoms: Making The World's Smallest Movie." 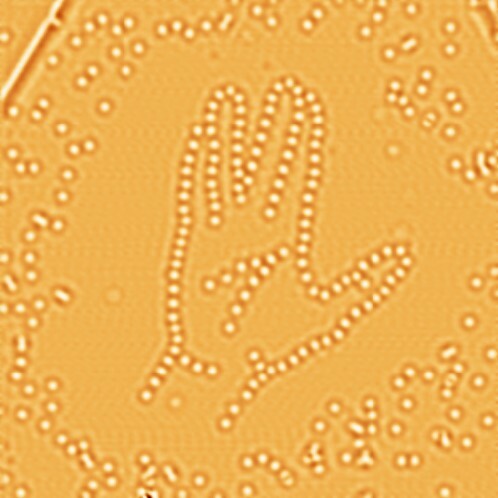 The movie and images were made with a Scanning tunneling microscope (STM), which earned it's inventors, Gerd Binning and Heinrich Rohrer, the Nobel Prize in Physics in 1986. C. Bai (2000). Scanning Tunneling Microscopy and Its Application. New York: Springer Verlag. pp. 2-3. STM can achieve atomic-level resolution. The lateral and vertical resolutions can reach 0.1 nm and 0.01 nm, respectively, i.e., individual atoms and molecules can be resolved. STM can be employed for the modification of a surface and for the manipulation of atoms and molecules through tip-sample interactions, opening up the prospects of constructing atomic- or melecular-scale devices. Not the answer you're looking for? Browse other questions tagged physics chemistry . How can we know meteorites found on Earth came from Mars? Is breaking bricks/wood “karate style” an impressive feat? Is there compelling proof against an alternative to the law of conservation of energy?